Nowadays, there are thousands of different marijuana strains available. However, it is exactly because of the abundance of strains that many cannabis growers, and especially the novice ones, tend to get very confused with picking the easiest to grow. Even those who do already have sufficient experience with growing their own green medication often search for strains that will be easy to cultivate with less of a fuss. We understand both the joy, as well as the challenges of cannabis cultivation. Below, we will share the top 10 easiest strains to grow indoors while also highlighting all the crucial factors you need to understand when picking the right strains that will work best for you. But first, we’ll go over some details to know before choosing a strain. Choosing the right marijuana strains can be as much of an exciting, butterflies-in-your-belly sensation as an overwhelming, headache-inducing task. Whether you browse the web or enter a dispensary, you’ll be hit with adjectives and phrases that serve to describe the unique traits of each cannabis strain, such as high-yielding, fast-flowering, pure Indica landrace strain, high CBD strain, sour, tall, bushy, easy to train, prone to mildew – and that’s just to name a few. So how do you actually choose the right marijuana strains that will be the easiest to grow indoors out of the myriad of varieties? As a rule of thumb, even marijuana strains that are labeled as fairly easy to grow may fail to prove to be the easiest for you. That’s why picking the right cannabis strains is such an intimate process and there are no short-cuts. Indoor marijuana growing is known to produce(slightly) decreased yields than outdoor growing. But on the bright side, indoor growers know well that their plants are safe and well-protected from the harsh meteorological conditions (as well as from those suspicious neighbors who love to peek behind the fence of your backyard). Indoor growing puts you in charge of providing the most suitable conditions for your green ladies to thrive so the entire control of the growing mission is in your own hands. And since you’re the one who dictates the rules, it is worth going that extra mile in choosing the most suitable strains to grow indoors easily. Because once you choose the right strains that match your personal taste, preferences, as well as the unique conditions that you can provide as an indoor grower, you won’t end up wasting your time. Instead, you will be able to grow healthy, vigorous, high-yielding marijuana plants while ensuring the privacy of your cannabis growing operation. Plus, you’ll get your very own stash of dank, potent, and delicious buds that feature top-shelf quality upon consumption. Here are the most important factors you want to consider when picking the easiest strains to grow indoors. Since even the easiest strains to grow indoors somewhere in Europe can turn out to be extremely challenging for some growers on the other side of the world, what’s your best move? You need to take into account the strains’ resilience to issues that are most likely to hit your indoor growing space. For instance, do you happen to live in a region where humidity levels are naturally high? That means you’ll be faced with more challenges when it comes to controlling the humidity in your growing space. In this case, some of the easiest strains to grow indoors will be those that are mold-resistant. If you happen to live in a region where humidity levels are rather low, picking a mold-resistant strain won’t make much of a difference in helping you grow. So when checking out the resilience of different marijuana strains, take into consideration only the factors that will play a key role based on the conditions that you can provide (or you will fail to provide) to your indoor cannabis plants. Will you be able to invest in reliable ventilation setups? What about the grow lights? Will they emit much of a heat? What’s the growing space you’re opting for – a tent, a closet, a spare room in your house? All of these questions matter when it comes to controlling the environment in your indoor marijuana garden (and, subsequently, in choosing the strains that will be the easiest to grow). Of course, using a thermometer and a hygrometer in your growing room is a must. But how many hours a day will you be able to set aside for taking care of your indoor marijuana plants? Even the most resilient plants will still need you to monitor their development and catch any possible issues in a timely manner. In a nutshell, if you don’t have much time and/or willpower to attend to the needs of your green ladies, choose the least demanding, most resilient strains that need a little training, pruning, and trimming as possible. Also, if you’re often on the go or don’t have much free time, pick strains that are able to tolerate fluctuations in temperatures and/or humidity levels. All that aside, don’t let frustration overwhelm you. Nobody gets born a pro-marijuana grower, and some of us are simply not blessed with that green thumb, but that’s totally fine. That doesn’t mean you won’t be able to enjoy your marijuana growing adventure and end up with juicy, fantastic buds. It just means you’ll need to be more attentive and selective in your choice of strains. Cannabis cultivation is constantly developing with a mind to easing the mission of growers worldwide. So get equipped with a healthy dose of patience and keep going. The Takeaway: Consider the resilience of marijuana strains based on the issues that are most likely to hit your indoor garden. Back in the glorious ’70s, most cannabis varieties featured THC level of up to 15%. Currently, things have dramatically changed. In the 21st century strains with a THC level of 15% are labeled as possessing only moderate potency in terms of their psychoactive effects. Undoubtedly, the most common effects associated with each strain are a very important factor when choosing the best varieties to grow indoors. THC and CBD levels have little to do with the growing difficulty of marijuana strains. In terms of potency, it is solely your personal needs and preferences that you want to take into consideration. Of course, the better you attend to the needs of your marijuana plants, the better the potency and the larger the buds. As a rule of thumb, if you’re looking for strains with high medicinal value, you want high levels of CBD (or other active cannabinoids whenever these are pointed out). For recreational marijuana users, higher THC to lower CBD content is what you’ll be looking for. Two equally important specifications that affect the expected effects, potency, as well as growth patterns of the strains in term of easy cultivation, are the Sativa vs. Indica genetics. Sativa strains are associated with being highly energizing, boosting the good mood and sociability, talkativeness, and improving your focus. Pure Sativa strains prove to be very difficult to cultivate indoors as they grow rather tall and lanky. Plus, they need plenty of sunlight and warmth and they spend a long time flowering. Indica strains are associated with possessing highly relaxing, sedating, calming, and pain-relieving properties that make them especially well-suited for those looking forward to unwinding after a long day. Indica strains are great for indoor growing as they grow into bushy, compact plants that flower relatively fast and are able to tolerate fluctuations in temperatures and humidity. Fortunately, the advanced breeding of different marijuana strains has made it possible to combine the desired effects attributed to Sativa strains with the much more compact size of Indica strains. So before you skip on any strain just because it of being too Indica or too Sativa dominant at first glance, read the provided descriptions regarding the most common effects and the growth patterns carefully. Picking cannabis strains from a reputable retailer should be your top priority. The Takeaway: Consider the Sativa to Indica genetic profile of the strains, along with the levels of THC to CBD level so that you will not only pick an easy strain to grow but also one that will suit your needs and personal preferences. Yield is another extremely important factor for hobby and professional growers alike. What are your goals when it comes to the expected yields upon harvesting? That’s a crucial question you want to answer in order to pick the right strain to grow indoors. Will the expected yields be enough to ensure you are well-supplied with your homegrown green medication before your next growing mission takes place? Are you willing to experiment with homemade marijuana treats such as edibles or homemade marijuana ointments such as creams? In this case, go for strains that will be able to provide high yields so that you can have more plant material to experiment with. How much marijuana do you tend to consume daily/weekly/monthly? Are you microdosing your cannabis intake? Do you need higher dosages of the green medication in the case you’re fighting with severe pain? These are only several questions to start with, and we are sure they can help you out when considering the expected yield that will work fine for you. The Takeaway: Consider your long-term goals as a marijuana user in order to choose strains that will be easy to grow while yielding enough flower to cater to your needs. Now, we get down to one of the most important factors for choosing the easiest strains to grow indoors – the photoperiod of the strains. There are three basic categories of marijuana seeds, namely regular, feminized, and auto-flowering. Regular marijuana seeds are produced through traditional breeding methods and you can end up with both male, as well as female marijuana plants. Only female marijuana plants are able to produce buds (yes, the main thing we’re looking for as marijuana users). However, male plants are not useless. They can be used to breed your very own cannabis seeds after pollinating female marijuana plants. But that’s a territory of the marijuana growers who are willing to invest more of their free time and efforts take indoor cannabis cultivation to the next level. Feminized marijuana seeds are created to produce female marijuana plants. 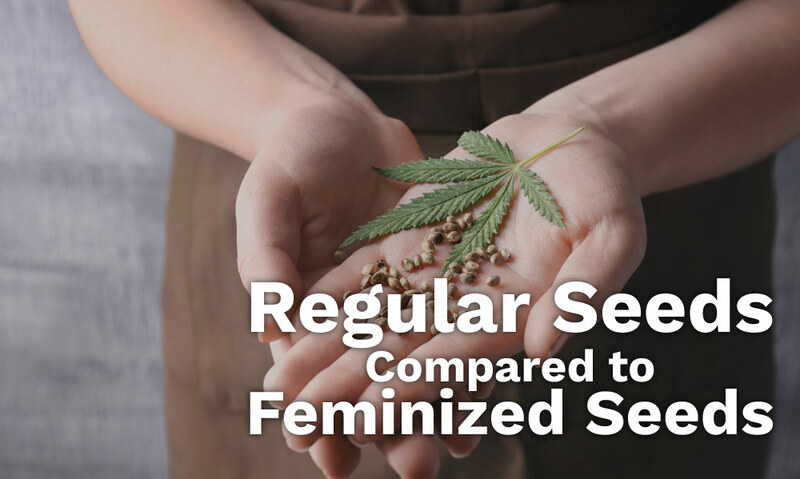 Feminized seeds are among the most favored choices of growers because they minimize the risk of attending to multiple marijuana plants just to end up with several useless male plants. When growing marijuana plants indoors, plants grown from feminized or regular seeds need to be exposed to a particular photoperiod to trigger flowering. That means you’ll need to be able to provide your plants with 12 hours of undisturbed darkness and 12 hours of undisturbed light to initiate budding. Auto-flowering cannabis varieties do NOT need to be introduced to any particular photoperiod to trigger flowering. That’s because auto-flowering cannabis varieties possess the one-of-a-kind genetic inheritance from an incredible and rare marijuana strain – Cannabis Ruderalis. Cannabis Ruderalis is a marijuana strain that has managed to develop certain qualities in order to survive while being exposed to harsh weather and lack of sufficient sunlight in the Northern Hemisphere where it originates from. That’s why auto-flowering strains are labeled as some of the easiest to grow indoors since you don’t need to worry about providing 12 hours of undisturbed light vs. undisturbed darkness to initiate flowering. Soon after the rise of auto-flowering strains, feminized auto-flowering strains also became widely available. Those who want to enjoy growing an auto-flowering variety without having to possibly deal with male marijuana plants are logically inclined to picking feminized auto-flowering strains. One of the biggest assets of auto-flowering varieties is their short flowering stage. 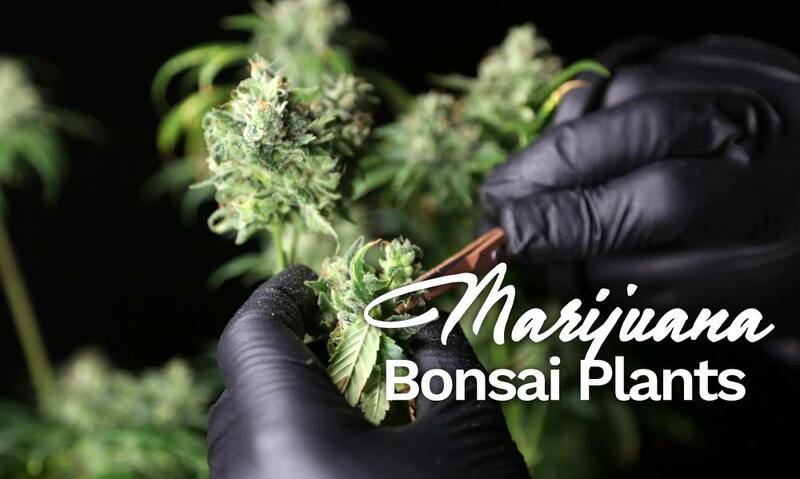 In the case time is your major concern in terms of easing your marijuana growing mission, auto-flowering strains can be a wonderful choice, and especially if you are looking into establishing an indoor marijuana garden all-year-round. But auto-flowering cannabis varieties do have their downsides. Generally, auto-flowering strains are estimated to produce decreased yields as opposed to strains grown from regular or feminized seeds. So if high-yielding flowers are your top priority, auto-flowering strains might not be your best choice. Also, keep in mind that auto-flowering plants are not auto-growing. They still need your love, care, and attention. What’s more, auto-flowering strains are especially sensitive to your possible mistakes as a grower during the early phases of their development, and in particular, during the second month of their growth. Since auto-flowers will keep growing while rapidly switching from vegetation to flowering, possible issues due to diseases will leave too little room for you to come up with a reliable and fast-acting solution. The Takeaway: Consider carefully which strain/will be the easiest to grow based on the photoperiod specifications, taking into account all the possible pros and cons that matter to you (and not to other growers). Remember, what works for some might not work at all for you. Traditional soil growing doesn’t come with the challenge of adjusting and monitoring the nutrient schedule, as well as the pH balance of hydroponic growing systems. Traditional soil growing allows you to opt for either synthetic or organic nutrient solutions while hydroponic growing works through employing only synthetic, hydroponic setups-tailored nutrients. However, soil does pose a higher risk of bacteria and disease plaguing your indoor garden, as opposed to hydroponic installations that let you grow your marijuana plants in a far better controlled, hygienic environment. Hydroponic marijuana growing is known to boost yields with approximately 30%, and it can also increase the potency and flavor of the strains. Many growers still tend to look upon hydroponic setups as something rather complex. However, there are multiple hydroponic growing systems that can cater perfectly to your level of experience with growing the green medication. Modern-day hydroponic systems are highly optimized (and come with built-in automatic features) to ensure you have to put as little efforts as possible. Another important factor that affects the ease and convenience of growing marijuana indoors is the intensity of the odor emitted by different strains. In a nutshell, if you are not willing to invest in advanced ventilation and odor control setups but you still need to keep your indoor marijuana garden away from the public radar, then you want to go for strains that are known to release a less pungent smell during flowering. The Takeaway: When looking for the easiest strains to grow indoors, consider the pros and cons of growing marijuana in soil vs. in hydroponics, based on your plans in the long run. Bearing its nickname because of the sticky resin that covers your scissors when you start collecting the sparkling buds, Gorilla Glue #4 marijuana plants are hardy, hearty creatures that can reward you with high yields of sugar-coated buds featuring out-of-this world potency. Active cannabinoids content:THC levels are very high, ranging from 25% to 30%. CBD levels are considerably low and rarely reach up to 1%. Gorilla Glue #4 is best-known for it’s potent, highly relaxing effects that almost inevitably lead to ending up “glued’ to the couch. This strain’s specialties include treating all kinds of pain, including tension in the muscles, as well as insomnia. It can also help with nausea and lack of appetite. The flavors of Gorilla Glue #4 feature a beautiful blend of spices, coffee, diesel, berries, dank earth, and sweet & sour fruitiness. Gorilla Glue #4 is a very resilient strain. It’s highly resistant to pests, mold, and mildew. Nevertheless, it shows high resistance to fungi, bacteria, and viruses. Last but not least, it is capable to recover quickly from mechanical damage so it is rather forgiving to the accidental mistakes of newbie growers. Gorilla Glue #4 has a relatively short flowering stage of 8 – 9 weeks. Yields are well above the average – about 18 ounces per square meter for indoor growers. However, this strain grows quite tall in height so if your growing space is limited in size, it might not be the best choice. Due to the fact this strain grows into tall plants, you’ll need to position your grow lights very carefully to make sure all the fan leaves and buds get equal access to light. Gorilla Glue #4 plants thrive when introduced to plenty of light, and that means you want to choose powerful, high-quality grow lights. Mind that you will also need to adjust and re-position the lights regularly as the plants keep growing, and this will take up some of your spare time. Gorilla Glue #4 strain does not tolerate high levels of humidity, so you want to keep the humidity in the growing room on the drier side. For best results, you want to maintain a consistent flow of fresh air, and especially once flowering begins and the buds start to get coated in sparkling THC. Gorilla Glue #4 plants have a tendency to hermaphroditism. Stay on the watch for male pollen sacks as hermaphroditism is reversible if you spot and remove the pollen sacks on time. Traditional soil growing gives excellent results with this strain although hydroponic setup can bring the results upon harvesting to the next level. A strain that originated from British Columbia, Canada, and Vancouver, Dutch Treat became widely-popular in Amsterdam where it is served in many cafes and shops in various forms. Despite the fact this strain produces yields below the average rates, it has a very high medicinal value and grows into rather short and compact plants that are easy to manage. Type: 80% Indica – 20% Sativa hybrid cross among parent strains that remain a mystery. Active cannabinoids content: THC levels are high, ranging from 18% to 25%. However, CBD levels are rather low – typically 0.2 – 0.5%. Dutch Treat is a strain with high value for medical and recreational marijuana users alike. Due to its powerful sedating effects, Dutch Treat makes a wonderful evening-use strain. This strain is recommended for chemotherapy patients, nausea and food disorders. It can be very effective in eliminating pain, stress, depression, and anxiety. The flavor blend includes sweet, sugary undertones with hints of berries, dank earth, Oakwood and pine. Dutch Treat is one of the most multi-resilient strains out there. It has a great tolerance to temperature and humidity levels fluctuations, as well as possible mechanical damage. These traits make it an excellent choice for beginner growers who may have a hard time controlling the environment in the growing room. It is also highly resistant to bacteria, viruses, and different tiny intruders such as insects and spiders. Nevertheless, this strain possesses a high resistance to mildew, mold, and spider mites. Dutch treat has a relatively short flowering stage as it spends about 8 to 9 weeks in flowering. Yield rates fall lower than the average, though, and indoor growers can expect to get approximately 12 ounces per square meter. However, the slightly decreased yields of this strain are compensated by the compact, short structure of the plants that make them much easier to cultivate indoors. For best results upon harvesting, humidity levels should be kept on the drier side. Watering schedules, as well as nutrient schedules, are very important in order to grow more flower from your Dutch Treat cannabeauties. This strain is known as a heavy feeder which means it can produce better yields when fed with the right nutrients. With this in mind, hydroponic growing is shown to work best for this strain. However, traditional soil growing can also work great. Examining the soil on a regular basis will help you avoid any possible issues related to imbalanced pH levels or possible diseases due to living organisms found in soil. Dutch Treat marijuana plants adore being introduced to the Sea of Green or Screen of Green growing methods. In order to ensure that light will be sufficient to feed the hungry buds, careful trimming of the fan leaves is necessary. Growing into sturdy and fast-flowering plants, Blue Cheese is a strain that has become best-known for its potency and distinct, pungent blend of aroma and flavors. Type: 80% Indica – 20% Sativa cross among Blueberry and UK Cheese marijuana strains. Active cannabinoids content: THC levels of Blue Cheese strain are potent yet balanced, ranging from 18% to 20%. Meanwhile, CBD levels are higher than the average and can reach up to 2%. Leaning heavily on its Indica genetics, Blue Cheese can provide a feeling of ultimate relaxation that often ends up leaving you in a blissful, sleepy and peaceful state of mind. The early onsets of euphoria and energy uplift gradually dissolve to help insomniacs cope with sleep disorders. This strain can provide effective pain relief and work especially well to soothe sore, tensed muscles. Blue Cheese can be an excellent choice to address daily stress, anxiety, depression, and mood disorders. The flavor features a blend of pungent cheese and skunky undertones mixed with hints of ripe berries. And while it can resist cooler temperatures, excessive heat might lead to troubles so controlling its exposure to the grow lights is crucial. Also, it is less tolerant of issues related to mildew and pests. Nevertheless, this strain can easily display nutrient deficiencies. Blue Cheese is one of the fastest flowering strains on this list, as it takes about 7 to 8 weeks to flower. Yields are well above the average, and you can expect approximately 18 ounces per square meter. In order to enjoy increased yields, you need to spend some time training your Blue Cheese plants. However, this strain responds well to various training techniques, so don’t be afraid to give it a boost. Low-stress training and the Screen of Green technique work best but you’d better avoid high-stress training techniques when growing this strain indoors. Blue Cheese plants respond beautifully to both traditional soil growing, as well as hydroponic growing. Just keep in mind that this strain does need some extra nutrients, and especially Nitrogen, Magnesium, and Calcium. Bringing out the mesmerizing purple hues of this strain is easy once you introduce it to slightly cooler temperatures by the end of flowering. However, be careful not to stress out your Blue Cheese plants and do your research before attempting to make the purple undertones pop up. Cinex is a beautiful example of modern-day crossbreeding as it possesses a unique blend that combines the effects of its Sativa inheritance with the growth patterns of its Indica inheritance. Best-known for its incredible potency, this strain has a short flowering phase but is capable of producing very decent yields. Type: 60% Sativa – 40% Indica cross among Vortex and Cinderella 99 parent strains. Active cannabinoids content: THC levels found in Cinex are very high, towering to about 25%. Meanwhile, CBD levels are quite low, ranging from 0.15% to 0.5%. The later onsets of the high develop into blissful mind-and-body relaxation, making Cinex a suitable remedy for depression and stress. Users can also expect to experience the Indica traits of the strain and enjoy reliable pain relief often followed by a couch lock effect. The flavors of this strain combine undertones of dank earth, pine, and citrus. Cinex marijuana plants show high resistance to both mold and mildew, and this makes up some room for errors that are highly unlikely to cause the failure of your growing mission. This strain can also tolerate cooler temperatures rather well. Cinex marijuana plants finish flowering quite quickly, within7 – 9 weeks. Yields are above the average, and if grown well, you can expect approximately 19 ounces per square meter. Even if your growing space is limited in size, Cinex can still be a wonderful, high-yielding strain to grow, especially when introduced to the SCROG method. Regular and careful trimming will also help you get maximized yields, and being easy to trim is one of Cinex’ best traits for growers who are looking for easy strains for indoor cultivation. Traditional soil growing can work very well with this strain, although hydroponic growing can significantly boost your yield upon harvesting. Cinex can be a beautiful addition to your indoor garden if you’re looking to grow something quite different from most strains out there. Originally known as Green Kush, one of the most legendary cannabis connoisseurs – Snoop Dogg, was the idea dynamo behind renaming this strain to Green Crack. Snoop Dogg compared the potent effects to the intense uplifting sensation that one can experience from the crack. This strain is best-known for its decent yields that are well above the average, and it does take little time to finish flowering. Active cannabinoids content: THC levels found in Green Crack vary from moderate to high within a 15% to 25% ratio. CBD levels are quite low, typically up to 0.11%. For those who want to experience an uplifting, high energy boost, Green Crack acts in just the way you would expect from a distinctly Sativa-dominant strain. The motivational high can be very helpful for boosting productivity and creativity and is highly recommended for treating depression and anxiety. This is a strain of high recreational value but with limited medicinal benefits in terms of pain relief. The flavors are described as a heavenly blend of sweet tropical fruits, and a twist of fresh citrus along with piney undertones. Green Crack marijuana plants are known as highly resilient to multiple possible issues. However, powdery mildew contamination is not one of them as this strain is known to be very sensitive to this particular threat. Mind that this strain won’t tolerate cooler temperatures very well. Due to its capacity to stretch, positioning your grow lights precisely and maintaining reliable access to light is a big must as you risk damaging your green ladies if deprived of consistent lighting. The flowering stage of Green Crack is mind-blowingly short for a distinct representative of the Sativa dominant strains – it only takes 7 – 9 weeks to flower. Meanwhile, this strain is capable of rewarding you with high yields of approximately 18 ounces per square meter. As we already mentioned above, this strain is prone to powdery mildew. In order to avoid any issues on that note, humidity levels must be perfectly well-controlled and kept on the drier side of the common recommendations for marijuana growing. Green Crack allows being easily managed, as long as the ventilation setup in your grow room works fine to provide a constant flow of fresh air. Traditional soil growing works excellent for bringing out the full potency of Green Crack. This strain thrives in temperatures of about 70 to 90 degrees Fahrenheit. Blue Dream has turned into a staple strain for marijuana growers and consumers alike. Offering high yields, superbly balanced effects,and potency, as well as an enticing blend of berry undertones, this highly resistant strain is an easy and rewarding choice for any cannabis cultivator. Type: 60% Sativa – 40% Indica cross of Blueberry Indica and Super Silver Haze. Active cannabinoids content: THC levels found in Blue Dream are well above the average, ranging from 17% – 25%. CBD content is also high, reaching approximately 2%. Blue Dream is high in another active cannabinoid, namely CBN that reaches levels of about 1%. The early onset of the high usually starts with a cerebral rush that quickly brings in waves of motivation, boosting your productivity and improving your ability to focus. Gradually, you can expect to feel pain-free and calm without feeling sedated so that getting along with your daily tasks can feel like a breeze. This strain can work wonderfully for treating chronic fatigue, lack of appetite, depression, and mild cases of muscle spasms but it is not recommended for treating anxiety disorders. The flavors come with distinctly sweet hints of blueberries and dank earth. Blue Dream marijuana plants are especially intolerant to spider mites attacks so if these intruders are commonly found in your region, you need to monitor your indoor garden frequently and carefully to catch any issues on time. Apart from spider mites, this strain tends to be very sensitive to fluctuations in the temperature. However, both spider mites attacks and fluctuations in temperature can be well-controlled indoors. This strain is capable of tolerating mechanical damage quite well so it will be forgiving to your possible mistakes. It is also highly resistant to mold, mildew, bacteria, and fungi. Heat damage is revertible with growing Blue Dreams in the case you spot and treat any heat-induced issues in a timely manner. Blue Dream marijuana plants have a flowering phase that is higher than the average – 9 – 10 weeks. But waiting can be worth it because this strain is known to produce very high yields – about 21 ounces per square meter. You want to be extra careful in order to spot spider mites on time as they are quickly attracted to the sweet scent of Blue Dream. In order to prevent spider mites attacks, you can take advantage of ladybugs as they are a natural spider mites’ predator. Suitable companion plants can also help to block pests from ravaging your indoor Blue Dream garden. Blue Dream responds great to both traditional soil growing and hydroponic growing. But for those growing in soil, mind that this strain is a heavy feeder and it adores nutrients. 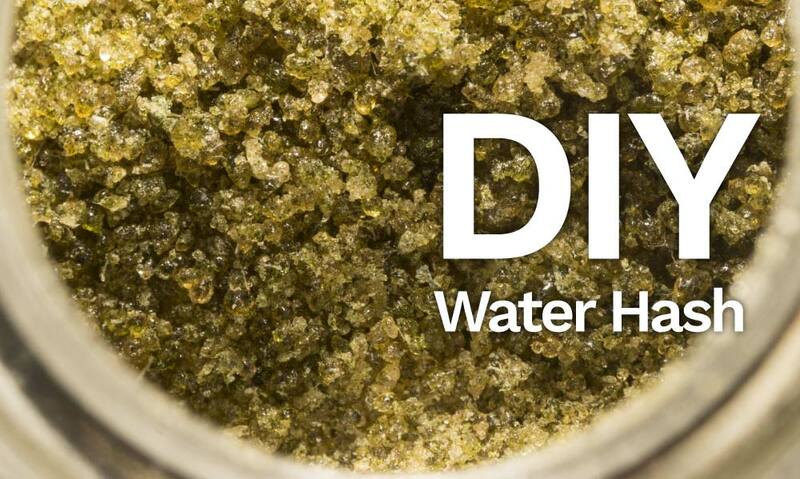 With hydroponics, you can be sure that your Blue Dream babes will get the right amount of nutrients but when growing in soil, you’ll need to put in some extra efforts. During vegetation, this strain will thrive when introduced to a healthy mix of Osmosis water, molasses, and liquid seaweed. Blue Dream marijuana plants tend to grow tall so regular re-positioning of the grow lights is very important. Known best for its delicious tropical taste, Papaya lives up true to its Indica genetic inheritance. For those who are looking to grow something special that is perfectly-suited for evening use, Papaya is a full mind-and-body relaxant that can make you forget about your pains and worries. Type: 80% Indica – 20% Sativa cross among Ice#2 and Citral #13. Active cannabinoids content: THC levels are well above the average and can get very high when grown successfully, ranging from 15% – 25%. However, CBD levels are barely present and rarely exceed 0.5%. Papaya is described as a hard-hitting strain due to the high levels of THC and the lack of sufficient CBD content resulting in a distinctly potent, head-to-toe type of high. It can alleviate even severe pains swiftly after consumption and can be especially suitable for treating depression, insomnia, stress, and eating disorders. A couch lock can kick in with the later onsets of the high as boosted creativity is typically followed by hazy laziness after consuming this tasty strain. The flavors carry a strong taste of sweet tropical fruits with unique undertones of mango, papaya, and spices. Papaya is a highly resilient cannabis variety, and it can tolerate fluctuations in the temperatures quite well. It is less prone to mildew, mold, and pests attacks than most strains. Nevertheless, accidental mechanical damage is highly unlikely to affect your indoor growing mission to the point of losing your green ladies. Papaya strain has a flowering phase that typically lasts 8 – 9 weeks. When it comes to expected yield, it is quite decent and you can easily enjoy about 15 ounces per square meter. However, this strain is sensitive to all things light-related. This means you must be extra careful when inducing flowering if you’re opting for a photoperiodic Papaya variety. Careful trimming will ensure the buds get reliable access to light as this strain tends to grow very, very bushy during vegetation. The Sea of Green, as well as the Screen of Green methods, can work wonders for this strain. In order to bring out the fantastic flavors of this strain, organic soil growing works best. But if boosted yields are your top priority, hydroponic setups will work better than traditional soil growing. Best known for the beautiful balance of energy and relaxation, Lemon OG Haze is an extremely flavorful strain featuring high levels of Limonene. Growing into rather compact and easy to train plants, Lemon OG Haze is an extraordinary flower to grow indoors. Type: 65% Sativa – 35% Indica cross of Lemon OG and Haze. Active cannabinoids content: THC levels found in Lemon OG Haze are very moderate and balanced, ranging between 12% – 16%. Meanwhile, CBD levels are quite high and can reach about 3%. Due to the high content of Limonene along with well-balanced levels of THC to CBD, Lemon OG Haze is capable of bringing the best out of its Indica and Sativa genetic inheritance. The cerebral buzz can feel quite energizing and motivational. As a result, users often report an uplift in the spirit, as well as creativity and productivity, ease of socializing and plenty to smile about. This strain can help to control chronic pain and muscle spasms and is highly recommended for alleviating stress, anxiety, fatigue, and depression. The flavors bring out a blend of pine and lemon peels with distinct hints of sweetness. Lemon OG Haze is not the most sensitive strain out there so it can be grown by beginner cannabis enthusiasts without much of a fuss. It can tolerate mechanical damage and is generally considered resistant to mold and mildew. However, this strain won’t tolerate well cooler temperatures. The flowering phase of this strain is on the average side as it usually takes 8 – 9 weeks. Lemon OG Haze can reward you with very decent yields, typically about 3.30 ounces per square foot. Being true to its Sativa genetic inheritance, Lemon OG Haze plants grow displaying a widely-branched structure along with leaves that are narrow and widely set apart. As this strain thrives when introduced to plenty of warmth and light, it is crucial to train your Lemon OG Haze cannabeauties by using techniques such as low-stress training in order to maximize yields. It is also essential to control the humidity levels and keep them on the higher side than the average humidity levels recommendations. Traditional soil growing works best with Lemon OG Haze, and gradually building your way up with organic nutrients can further enhance the mouth-watering flavors. Created by Dutch veterans back in the 1990s, White Widow won its first High Times’ Cannabis Cup in 1995. Ever since, this strain has managed to keep its legendary status thanks to the out-of-the-charts resin production, excellent medicinal benefits, ease of cultivationand high yields. Type: 60% Indica – 40% Sativa hybrid cross among a South American Sativa and a South Indian Indica. Active cannabinoids content: THC levels are high, ranging from 18% – 25%. CBD content varies from low to above the average – 0.30 – 1.50%. White Widow is high in yet another active cannabinoid – CBN – that can reach the spectacular 4.50%. White Widow’s potent effects are no less extraordinary than the sparkling resin covering the juicy buds. The high kicks in quick and settles in for hours. However, the long-lasting high doesn’t result in gluing you to the couch, leaving you incapable of enjoying a wonderful night with friends or the things you love doing the most while chilling out. Instead, the potent cerebral buzz commonly results in inducing laughter, making you more social and talkative, as well as laid back and filled with creative juices. Meanwhile, the body is blanketed in a heavenly state of relaxation, far away from pains and aches including musculoskeletal and neuropathic pains. The flavors are as cult-classical as this strain can get, featuring a blend of dank earth and moss along with hints of herbs and spices. White Widow plants are very resilient creatures. They can cope fair well with issues related to bacteria, viruses, spiders, spider mites, molds, and mildew. Nevertheless, this strain recovers fairly well from mechanical damage. White Widow marijuana plants take 8-9 weeks to flower. And while the flowering phase is not the shortest one, it can be worth the extra waiting because yields can be very generous, typically about 18 ounces per square meter. As this strain grows only to medium height and isn’t too sensitive to mechanical damage, it is considered quite easy to manage. In order to enjoy maximized yields, make sure to give this strain a nutrient boost. Whether you go for traditional soil growing or hydroponics, White Widow can reward you with equally potent buds upon harvesting. However, hydroponic setups can greatly increase yields with this strain. Diligent trimming is of utmost importance to make sure the buds are well-exposed to the grow lights. 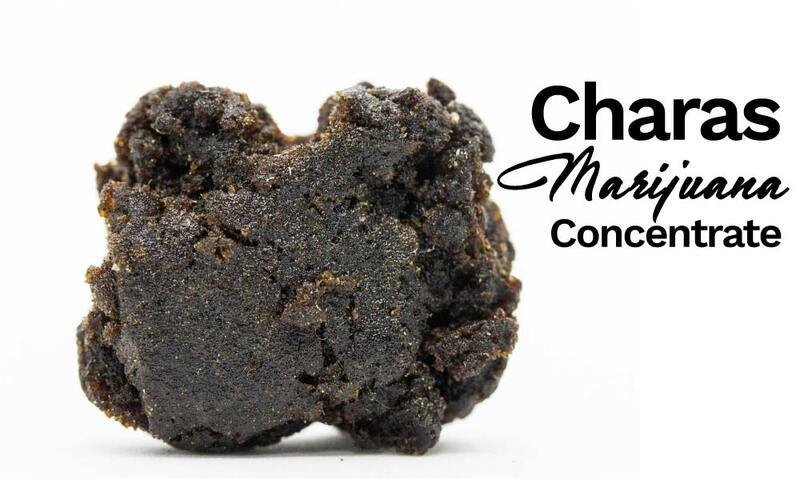 Best known for inducing a potent range of effects that combine waves of euphoria with long-lasting physical relaxation and supreme flavors of buttery cream caramel, this strain is a high-yielder that has won several 1st place Cannabis Cups awards. Type: 90% Indica – 10% Sativa hybrid cross among Blue Back, White Rhino, and #1 Maple Leaf. Active cannabinoids content: THC levels with this strain are high, ranging from 15% – 25%. However, CBD levels vary from low to well above the average – from 0.01 to 1.60%. Although low, CBN is also present within up to 0.60%. Although Cream Caramel is a highly dominant Indica hybrid, the high isn’t associated with inducing the couch lock effect. Instead, this strain energizes the mind and swiftly uplifts the mood while simultaneously leaving the body pain-free and fully yet moderately relaxed. This strain is considered especially beneficial for treating pain, inflammation, seizures, stress, anxiety, and mood disorders. The flavors feature an exceptional blend of honey, butter, and coffee with a distinct sweetness lingering on the palate. True to its Indica genetics, Cream Caramel is capable of tolerating fluctuations in temperatures much better than most strains. Humidity levels should be well-controlled but Cream Caramel can be still quite forgiving to your possible mistakes on that note. This strain is also resistant to molds and mildew but pests attacks might be an issue. Cream Caramel has a relatively short flowering phase – 7- 9 weeks. Meanwhile, yields are very decent, and you can expect about 3.50 ounces per square foot. This strain grows to medium height so proper training and trimmingwill ensure that you get maximized yields. The Screen of Green method is especially well-suited for growing Cream Caramel. Mind that you’ll need to reposition your grow lights carefully throughout your growing operation, most frequently when switching from vegetation to flowering. Traditional soil growing can work great but don’t forget to give your Cream Caramel garden a good nutrient boost. Hydroponic setups can provide increased potency and flavors, although organic soil growing will bring about the entire spectrum of delicious flavors out of this sweet flower. Too many guides and tutorials simply focus on listing the top easiest strains to grow indoors. But just think about all the different cannabis growers out there – some of you will grow in soil, some will grow in hydroponics; some of you will be good at trimming their plants, while others will need a cannabis variety that requires less maintenance. Some of you are mostly concerned about bigger yields while others will be focused on growing strains of high medicinal value even if that means ending up with decreased yields. Thus, some of the easiest strains to grow indoors for you may turn out to be quite unsatisfying in terms of easy growing for others. That’s why we have compiled the top easiest strains to grow indoors by listing a little bit of something that can suit each cannabis cultivator based on the factors that truly matter to you: Sativa to Indica traits, flowering phase, expected yields, most common effects, flavors, and resilience, sprinkled with tips for easy growing. We hope you’ll enjoy reading this article again and again, just as we enjoyed compiling it. And if you do have any thoughts, comments, extra tips, or questions – we’re always happy to hear back from you. Join us on our mission of making cannabis cultivation happy and easy for all our fellow growers out there!